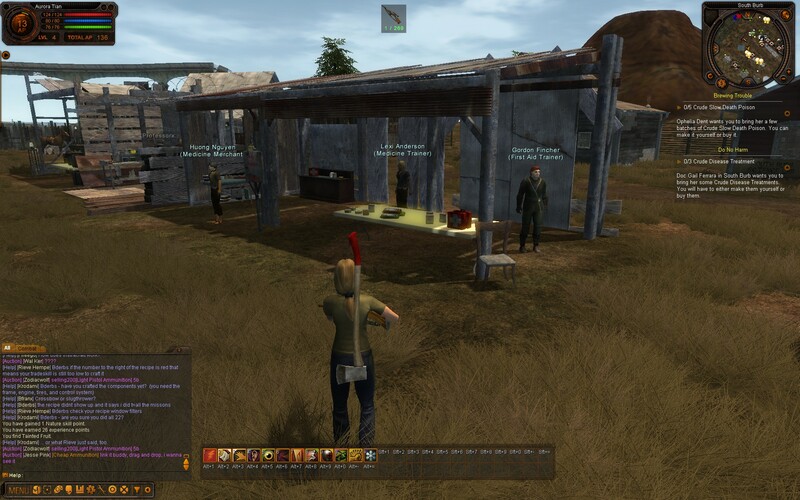 Check out the quick start guide that Azuriel put up – lots of great info there, complete with handy screenshots! The guide also shows how to fix the “slow turning camera” issue I mentioned in my last post – so many thanks! Now I can turn (via the mouse) and not feel like I’m stuck in molasses. 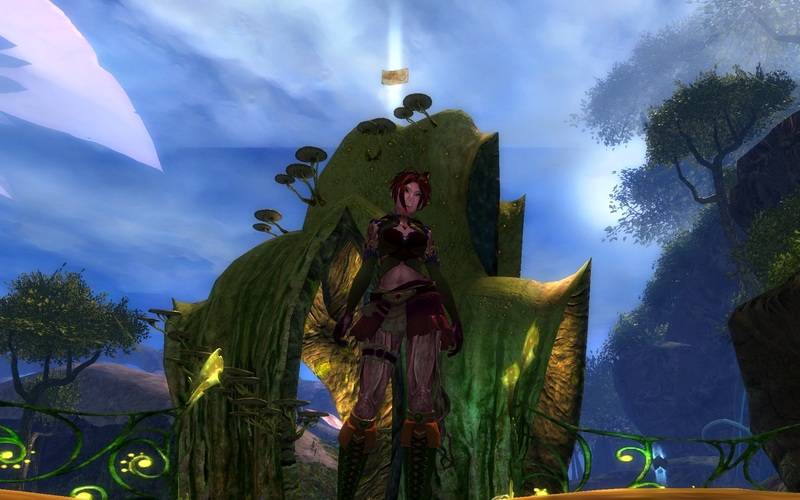 I’m continuing to have fun in Guild Wars 2, taking it easy, seeing the sights, exploring and doing various quests (filling in hearts). 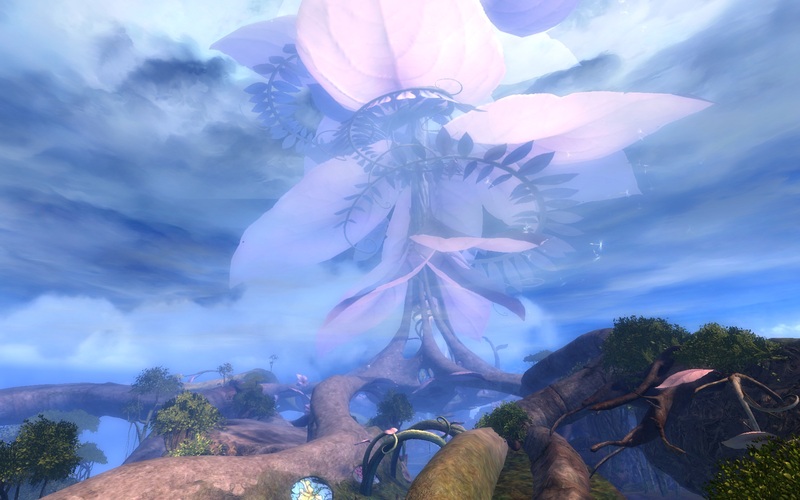 So far I enjoy the Asura and Sylvari areas the most, because of the scenic landscapes. 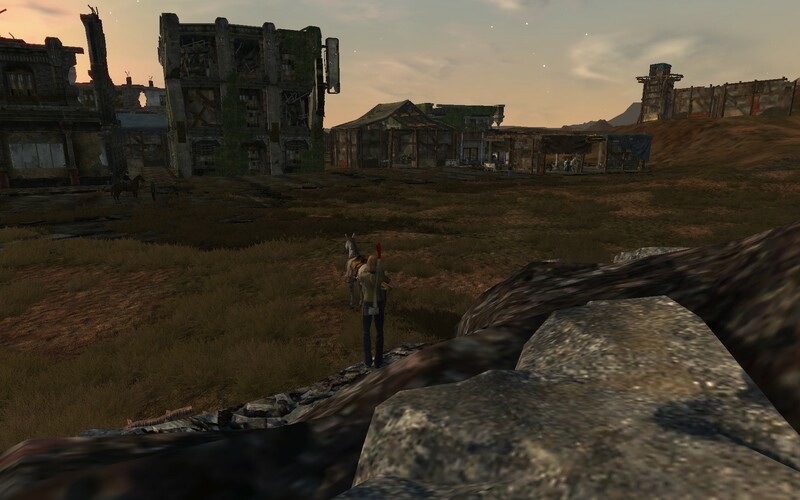 I don’t enjoy the Charr area quite as much, with its blasted wartorn wasteland vibe. 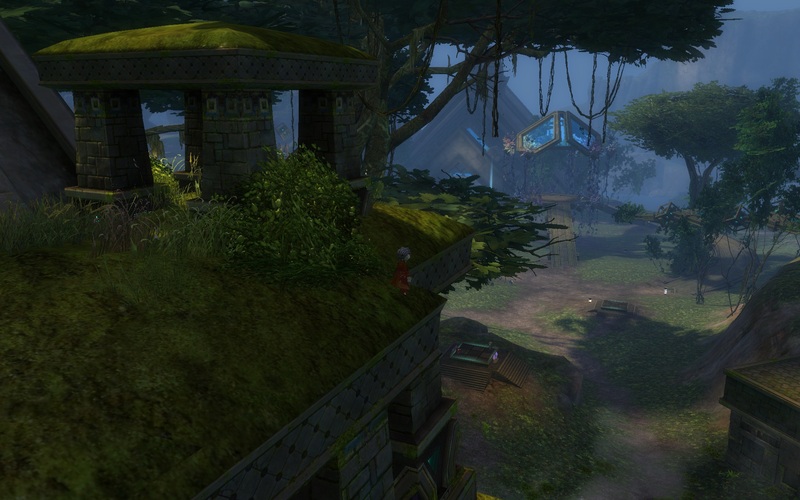 I think the artists nailed the Charr area; I just happen to like a different look. 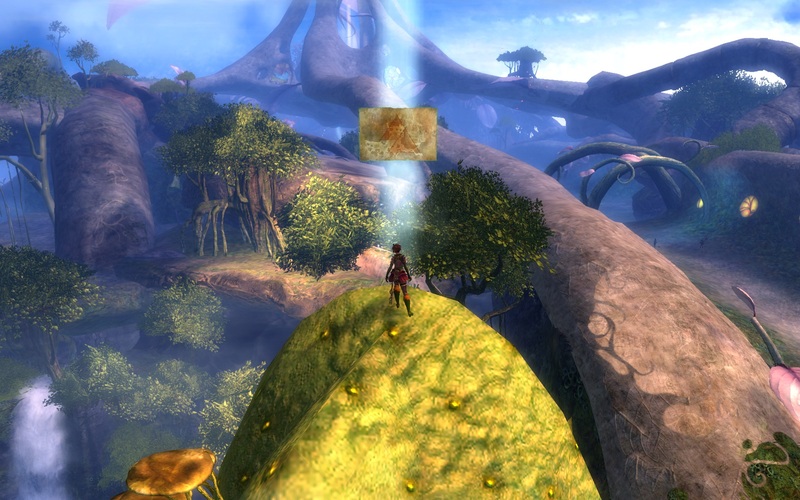 Anyway, I’ve found something kinda fun to do – those jumping puzzles to get to scenic vistas! When I’m near one, I spend a little time trying to figure out how to get to the map piece. 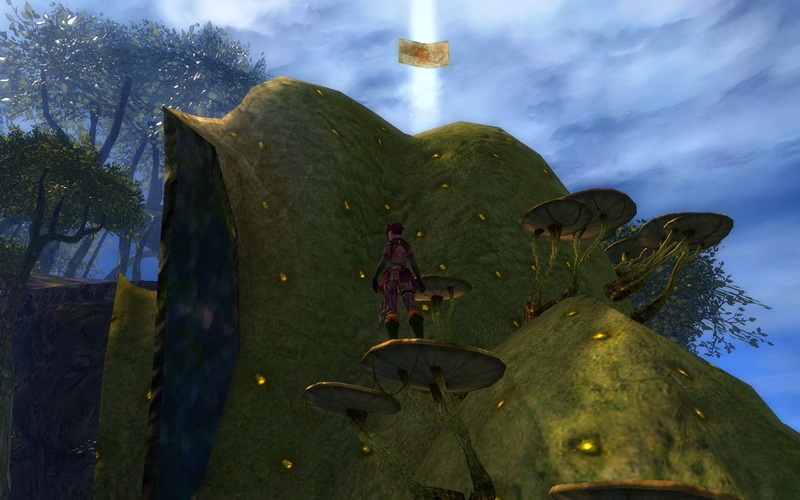 I totally get that some people hate them, but so far I’m having fun with them.. For example, here is my Sylvari mesmer at the bottom of the jump puzzle inside The Grove near the Caledon Path gate. The glowy map piece is visible at the top. So, the much anticipated day that Guild Wars 2 rolled out early finally arrived… I couldn’t stay up until 3 am Eastern time (or maybe midnight since there was a hint the game might open early. But I’m not staying up late just in case.) so I tried grabbing some character names I wanted early Saturday morning. I had limited success, only getting 1 name out of 4. Oh well. The name I did get was “Glyneth”, from one of my favorite fantasy novels: Lyonesse: Suldrun’s Garden. The other 3 names I was hoping for were also from that book: Aillas, Suldrun, and Dhrun. Since other guild members from GW1 left a message that they were going to Dragonbrand, that’s where I started. 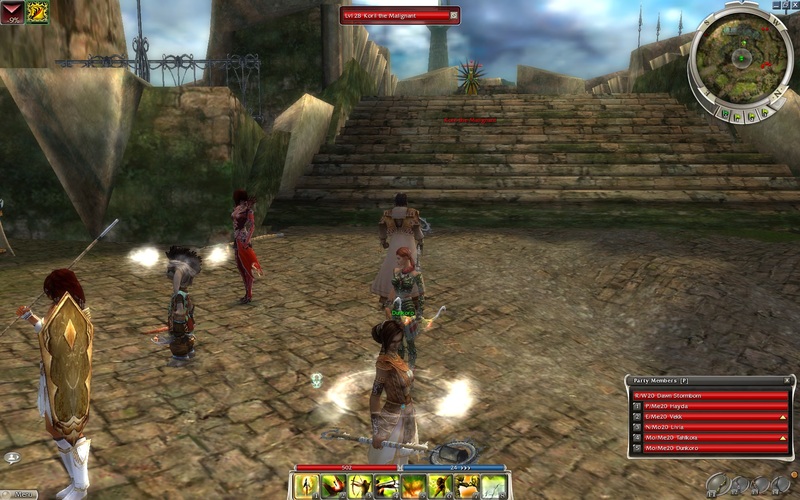 Eventually I hope to catch up to my former guildies and join them again. The reason I decided to try an ele in GW2 first, is from reading other blogs that noted how many different skills eles have – basically 4 times as many considering the elemental skills unlocked across all the weapon types. I figured that would provide huge variety so why not see if I liked an ele from the start? I also rolled up a few other characters, filling all my slots. I made 5 different races and 5 different professions – not that I’ll play them all, but I may dabble a bit. 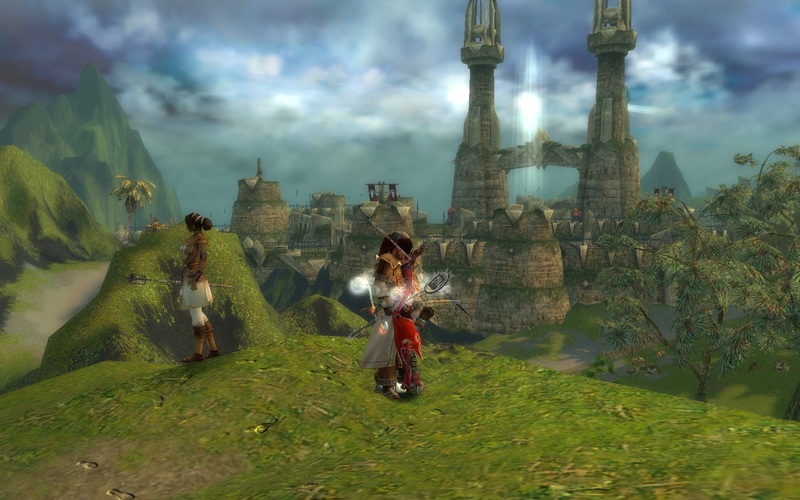 I have an Asuran elementalist, a Sylvari mesmer, a Norn ranger, a Human guardian, and a Charr engineer. So no thief, warrior, or necromancer for me, unless I buy more character slots. Even then, I’ll be plenty busy with the 5 I created, no need to bury myself even more. So far so good, and my only complaint is with controlling the view. Turning (rotating the view) seems sluggish, like there is a bit of delay at first and then an acceleration to catch up. Perhaps this is partly a graphics card/driver issue or an option somewhere. At this point, my play style will shift a little bit (except not so much this time – more on that later). When I hit max level, I prioritize the epic storyline over regular questing. That’s because epic quest rewards are often nice equipment upgrades. I do enjoy regular questing and am somewhat of a completionist, so I’ll continue exploration/regular questing… after catching up on the epic storyline. Currently, Naerys is at III 6.6 – Downriver Dangers. Goal: finish up before RoR releases! I don’t worry too much about virtues while leveling; however at max level they are something I revisit and tweak a bit. I believe in mitigation over straight stat bonuses, which is reflected in my virtue choices (except for Valour). It may not make sense to slot Valour anymore – Naerys’ morale is hovering around 9000, so the Valour bonus of +389 (if Valour is maxed at 14) is 4%, not very compelling, especially considering some of the kill deeds I’d have to do. Every little bit of morale helps, but the only time that 389 extra morale would literally make a difference in avoiding defeat would be in the following situation: Naerys is brought under 389 morale, and then survives the fight. After all, lowering morale via damage to 500 and then avoiding defeat means that the extra cushion wasn’t needed (the margin would have been even thinner, but still positive); meanwhile lowering morale down to 500 and being defeated anyway also means the cushion didn’t matter. But in that small space where Naerys is in a fight and gets down to 200 morale (for instance), has time to heal or drink a potion, and then goes on to survive… well then, in that case, the Valour bonus actually mattered. So I’m considering booting mitigation and/or resistances further and slotting one of these virtues instead of Valour: Patience, Tolerance, Idealism, Compassion, Fidelity, Confidence. Idealism has a slight advantage in that Naerys already has it to 13, meanwhile Compassion and Fidelity at 12 are not far behind. I do enjoy crafting and making gear, but I survive on quest rewards until I hit max level. Naerys is an Armourer, and will work on Metalsmith and Tailor… meanwhile Dhrun is my Tinker (Jeweler) but he’s 10 levels lower and way back at Echad Dagoras. I’ll inventory the armor Naerys currently uses, and see if there are reasonable upgrades available via crafting. Lately, the top crafting recipes come via reputation vendors or crafting guild recipes, so I’ll also investigate there as well. 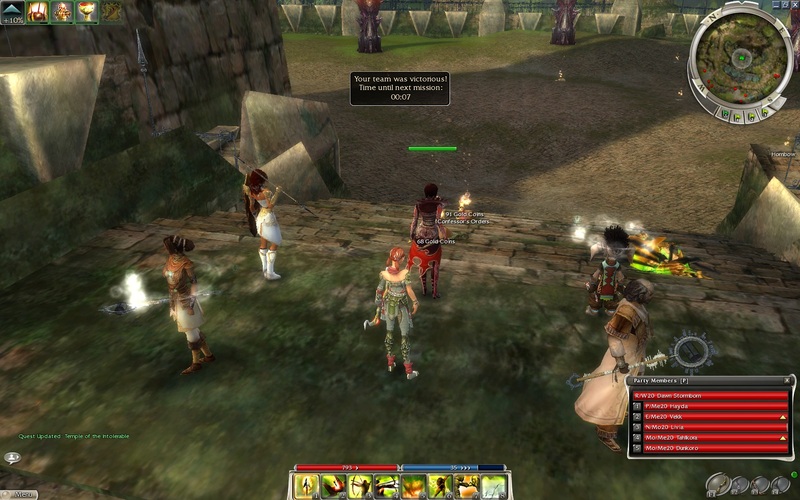 (Building up reputation is one reason to peck away at exploration questing vs epic storyline). Naerys is also using the same Legendary Items she had 10 levels ago. That’s right, a Third Age level 65 club and Third Age level 65 belt (I have the Second Age LI from the epic storyline but haven’t built up its legacies yet). I just don’t have time to grind out incremental improvements. At least I’ve been leveling up secondary items and deconstructing those for shards, relics, etc. so eventually when I get new Legendary Items, I’ll have something to slot on them. I need to figure out where to get level 75 Legendary Items – usually it is a barter NPC. I’ll get into this in another post, since a trait loadout ties back to Legendary Items and the legacies chosen for them (i.e. pick legacies that buff the traits you choose to equip!). I’ve been using the same general class traits for many levels and am happy with them, so I’ll probably stick with my choices. I saw the Dev Diary highlighting upcoming changes for Guardians in RoR, but nothing I read made me think I need to make sweeping changes. 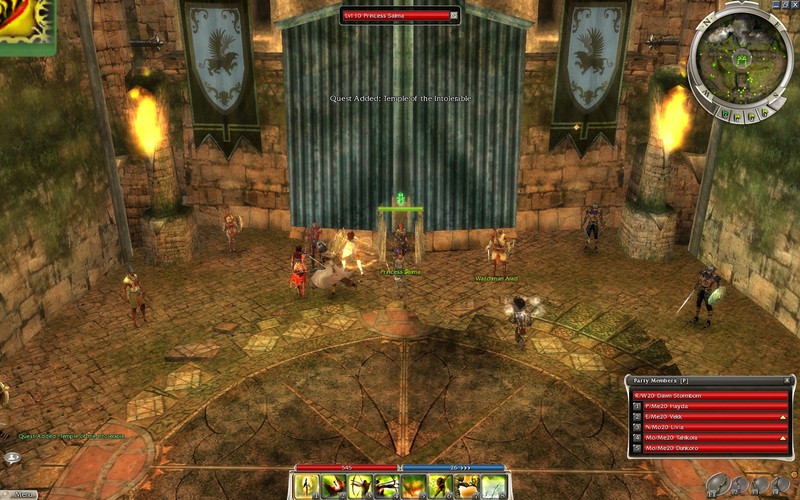 Skirmishing is fun – they are all quick enjoyable action with variety in settings and goals (offense vs defense). 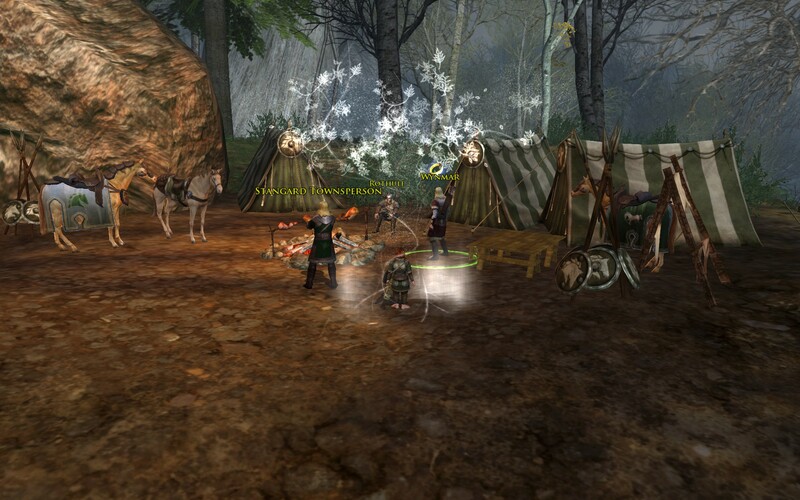 One nice bonus is earning points which are useful for other goodies, from skirmish skills to LI boosts to gear. I don’t skirmish much while leveling – once again it is something I shift to doing at max level. If I don’t get to skirmish much, I’ll at least try out the new ones that have released. 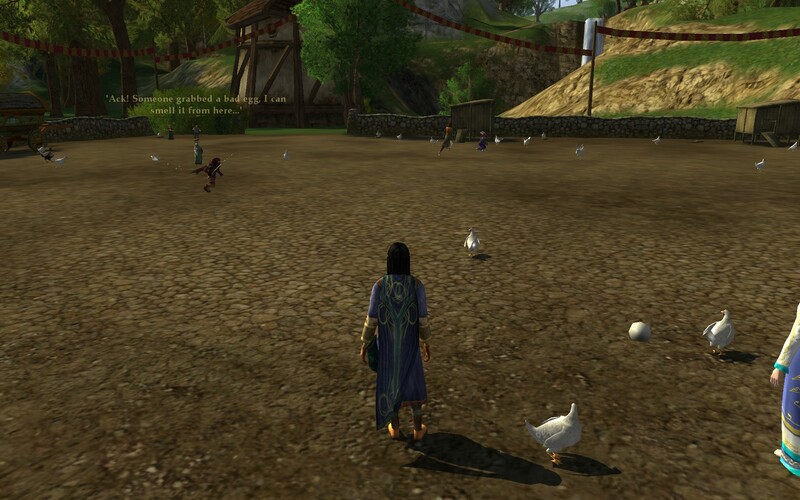 I felt like taking it easy, so I participated in the Farmer’s Faire. I hadn’t played my Rune-keeper Daerellaen in quite some time so I logged in on her for a bit. 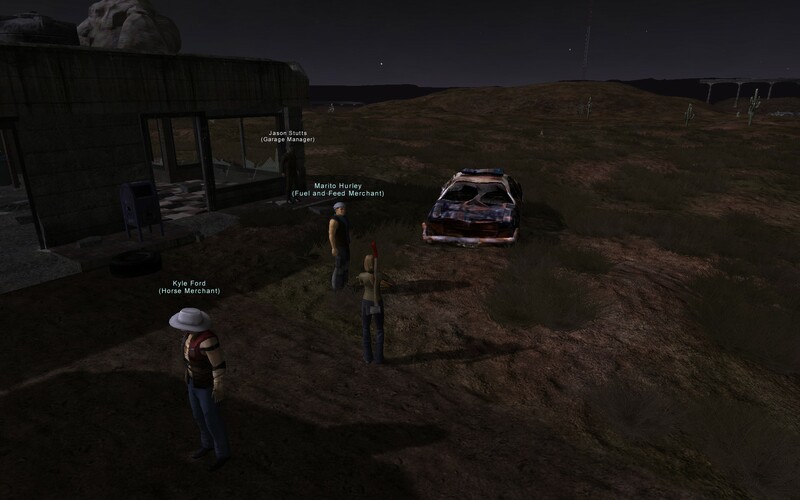 After speaking to the Festival Announcer, I took the tour in order to familiarize myself with the available events. First stop was to visit a fishing hole, then an Egg Scramble, and finally a Mushroom hunt. All sounded interesting but I decided to try the Mushroom hunt first. The goal was to eat 8 mushrooms without being spotted by the farmer’s dogs. The field was medium sized and several mushrooms spawned in the borders… the key was to keep moving and duck into another row when a dog was near. Some of the mushrooms gave a minor poison effect, while others gave a hallucination effect, with a washed-out view similar to what happens when you drink too much. 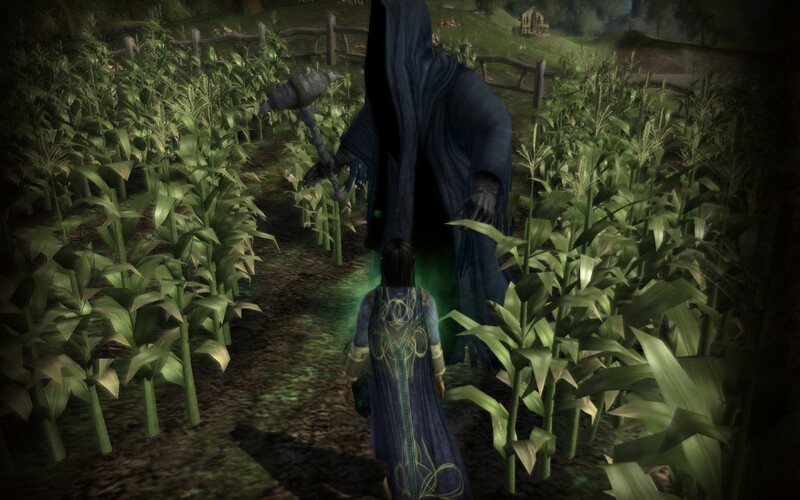 I ate a bad mushroom, or perhaps the Nazgûl are mushroom lovers too. Unfortunately I was spotted after eating 7 of 8 mushrooms! Argh… so I tried again. I failed even sooner, at only 2 of 8, due to bad luck moving from one row to another right on top of one of the dogs. Sensing this wasn’t my night for the mushroom hunt, I returned to the Festival Announcer and completed the quest, earning more tickets so I can try again later. 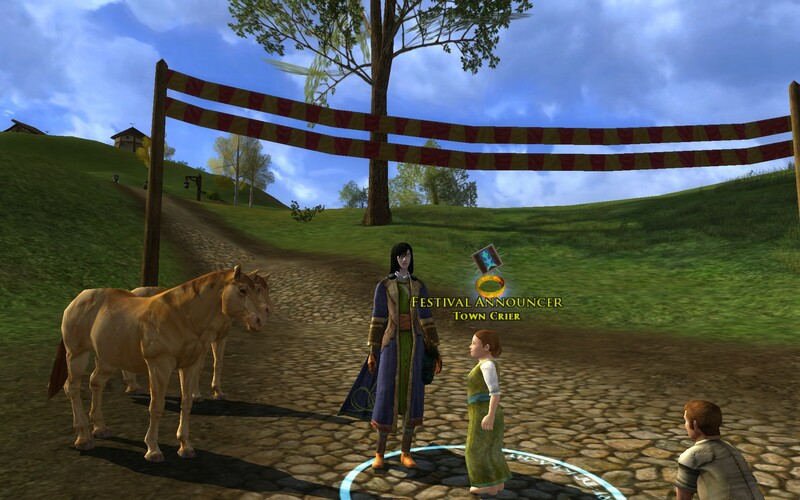 A Casual Stroll to Mordor has an excellent guide available for this event: Farmer’s Faire Guide.